Everyone has their favorite places that they like to hang out at. 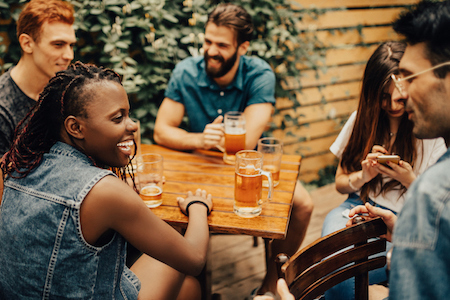 If going to the bar is your thing, then it’s worth it to know what you’re getting yourself into before you leave the house so that you can have a great time. Here’s 5 different types of bars and how to experience them. If you’re looking for cheap drinks and a rowdy crowd that’s ready to party, then the college bar is what you’re looking for. College bars are a lot like going to a college house party. Expect that it will be hot and filled to max capacity with a DJ playing the latest hits. If you want to have a good time here, you have to enjoy beer pong, dancing, and shots. Dress comfortably in jeans. Skip the super nice clothes unless you want your favorite shoes to be covered in grime from the floor by the end of the night. Sports bars are where all of the action is. 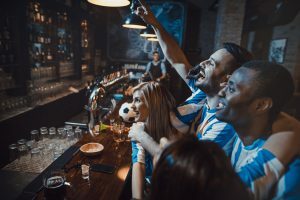 At the sports bar, every wall is plastered with giant flat screen TVs, they have food that will give you a heartache, and they have plenty of craft beers on tap. If you want to watch the game but don’t have a huge TV at home, then head over to the sports bar and you’ll feel like you’re right at the stadium. The best way to enjoy a sports bar is to get there before the game starts so that you can grab a seat. Make sure you can comfortably view all of the TVs in the bar from your seat. Finally, bring plenty of cash so you can keep ordering rounds for your crew to make good on all of those bets. Don’t forget to order some wings, as well. Pro tip: If you don’t want to start a bar fight, don’t wear gear from the team everybody hates (unless you have a death wish). If you’re feeling edgy or just really don’t care about what other people think about your drinking habits, then the dive bar is the perfect place for you. 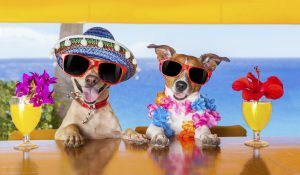 Dive bars range from seedy biker gang hangouts to low-budget bars where you can easily find a quick shot of tequila. If drinking is your game tonight, then the dive bar is calling your name. Don’t worry about the dress code, you’ll fit right in whatever you’ve been wearing all day. Go and strike up a conversation with some randoms and get ready to meet some interesting people. If you love to smoke cigars, a cigar bar is a place that you should try at least once. Most cigar bars are just like lounges with dim lighting and comfortable seating. You can order your favorite Bourbon and choose from an extensive selection of fine cigars. When you go there, you’ll want to dress up a bit. Don’t be afraid to spurge a bit so that you can enjoy the best that they have to offer. It’s also a great way to enjoy a night out with the guys. Are you looking for a place to complain about your life or tell tall tales to strangers over drinks? The Irish pub is the best place to do this since they’ve literally done it since the Middle Ages in Ireland! To really enjoy an Irish pub, go there after work to grab a beer. Make sure to order some dinner as Irish pubs usually have excellent Irish-themed home cooked favorites such as Bangers and Mash or Shepherd’s Pie. It’s a pretty relaxed place to enjoy a chat with a stranger or watch a bit of the game.